For the historical founder of Buddhism, see Gautama Buddha. "Buddhas" redirects here. For other uses, see Buddha (disambiguation). Seated Buddha, from the Seokguram, Silla. In Buddhism, buddhahood (Sanskrit: buddhatva; Pali: buddhatta or buddhabhāva; Chinese: 佛果) is the condition or rank of a buddha "awakened one". The goal of Mahayana's bodhisattva path is Samyaksambuddhahood, so that one may benefit all sentient beings by teaching them the path of cessation of dukkha. Mahayana theory contrasts this with the goal of the Theravada path, where the goal is individual arhatship. In Theravada Buddhism, Buddha refers to one who has become awake through their own efforts and insight, without a teacher to point out the dharma (Sanskrit; Pali dhamma; "right way of living"). A samyaksambuddha re-discovered the truths and the path to awakening and teaches these to others after his awakening. A pratyekabuddha also reaches Nirvana through his own efforts, but does not teach the dharma to others. An arhat needs to follow the teaching of a Buddha to attain Nirvana, but can also preach the dharma after attaining Nirvana. In one instance the term buddha is also used in Theravada to refer to all who attain Nirvana, using the term Sāvakabuddha to designate an arhat, someone who depends on the teachings of a Buddha to attain Nirvana. In this broader sense it is equivalent to the arhat. Buddhahood is the state of an awakened being, who having found the path of cessation of dukkha ("suffering", as created by attachment to desires and distorted perception and thinking) is in the state of "No-more-Learning". There is a broad spectrum of opinion on the universality and method of attainment of Buddhahood, depending on Gautama Buddha's teachings that a school of Buddhism emphasizes. The level to which this manifestation requires ascetic practices varies from none at all to an absolute requirement, dependent on doctrine. Mahayana Buddhism emphasizes the bodhisattva ideal instead of the Arhat. 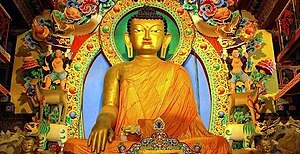 The Tathagatagarba and Buddha-nature doctrines of Mahayana Buddhism consider Buddhahood to be a universal and innate property of absolute wisdom. This wisdom is revealed in a person's current lifetime through Buddhist practice, without any specific relinquishment of pleasures or "earthly desires". Buddhists do not consider Gautama to have been the only Buddha. The Pāli Canon refers to many previous ones (see list of the named Buddhas), while the Mahayana tradition additionally has many Buddhas of celestial origin (see Amitābha or Vairocana as examples, for lists of many thousands of Buddha names (see Taishō Tripiṭaka numbers 439–448). The various Buddhist schools hold some varying interpretations on the nature of Buddha (see below). The Buddha, in Greco-Buddhist style, first-second century, Gandhara (now Pakistan). (Standing Buddha). All Buddhist traditions hold that a Buddha is fully awakened and has completely purified his mind of the three poisons of craving, aversion and ignorance. A Buddha is no longer bound by saṃsāra, and has ended the suffering which unawakened people experience in life. Most schools of Buddhism have also held that the Buddha was omniscient. However, the early texts contain explicit repudiations of making this claim of the Buddha. The tenth epithet is sometimes listed as "The World Honored Enlightened One" (Skt. Buddha-Lokanatha) or "The Blessed Enlightened One" (Skt. Buddha-Bhagavan). This section contains too many or too-lengthy quotations for an encyclopedic entry. Please help improve the article by presenting facts as a neutrally-worded summary with appropriate citations. Consider transferring direct quotations to Wikiquote. In the Pāli Canon, Gautama Buddha is known as being a "teacher of the gods and humans", superior to both the gods and humans in the sense of having nirvana or the greatest bliss, whereas the devas, or gods, are still subject to anger, fear and sorrow. In the Madhupindika Sutta (MN 18), Buddha is described in powerful terms as the Lord of the Dhamma (Pali: Dhammasami, skt. : Dharma Swami) and the bestower of immortality (Pali: Amatassadata). the Tathagata—the supreme man, the superlative man, attainer of the superlative attainment. "And so, Anuradha—when you can't pin down the Tathagata as a truth or reality even in the present life—is it proper for you to declare, 'Friends, the Tathagata—the supreme man, the superlative man, attainer of the superlative attainment—being described, is described otherwise than with these four positions: The Tathagata exists after death, does not exist after death, both does & does not exist after death, neither exists nor does not exist after death'? In the centuries after his final Nibbāna it sometimes got to the stage that the legends and myths obscured the very real human being behind them and the Buddha came to be looked upon as a god. Actually, the Buddha was a human being, not a 'mere human being' as is sometimes said but a special class of human called a 'complete person' (mahāparisa). Such complete persons are born no different from others and indeed they physically remain quite ordinary. Sangharakshita also states that "The first thing we have to understand - and this is very important - is that the Buddha is a human being. But a special kind of human being, in fact the highest kind, so far as we know." When asked whether he was a deva or a human, he replied that he had eliminated the deep-rooted unconscious traits that would make him either one, and should instead be called a Buddha; one who had grown up in the world but had now gone beyond it, as a lotus grows from the water but blossoms above it, unsoiled. It is important to stress that, despite modern Theravada teachings to the contrary (often a sop to skeptical Western pupils), he was never seen as being merely human. For instance, he is often described as having the thirty-two major and eighty minor marks or signs of a mahāpuruṣa, "superman"; the Buddha himself denied that he was either a man or a god; and in the Mahāparinibbāna Sutta he states that he could live for an aeon were he asked to do so. However, Thích Nhất Hạnh, a Vietnamese Buddhist monk in the Zen tradition, states that "Buddha was not a god. He was a human being like you and me, and he suffered just as we do." Jack Maguire writes that Buddha is inspirational based on his humanness. A fundamental part of Buddhism's appeal to billions of people over the past two and a half millennia is the fact that the central figure, commonly referred to by the title "Buddha", was not a god, or a special kind of spiritual being, or even a prophet or an emissary of one. On the contrary, he was a human being like the rest of us who quite simply woke up to full aliveness. Basing his teachings on the Lotus Sutra, the Chinese monk Chi-hi (the founder of the Tendai Sect) developed an explanation of life "three thousand realms in a single moment", which posits a Buddha nature that can be awakened in any life, and that it is possible for a person to become "enlightened to the Law". In this view, the state of Buddhahood and the states of ordinary people are exist with and within each other. In their view, the Buddha is equipped with the following supernatural qualities: transcendence (lokottara), lack of defilements, all of his utterances preaching his teaching, expounding all his teachings in a single utterance, all of his sayings being true, his physical body being limitless, his power (prabhāva) being limitless, the length of his life being limitless, never tiring of enlightening sentient beings and awakening pure faith in them, having no sleep or dreams, no pause in answering a question, and always in meditation (samādhi). A doctrine ascribed to the Mahāsāṃghikas is, "The power of the tathāgatas is unlimited, and the life of the buddhas is unlimited." According to Guang Xing, two main aspects of the Buddha can be seen in Mahāsāṃghika teachings: the true Buddha who is omniscient and omnipotent, and the manifested forms through which he liberates sentient beings through skillful means. For the Mahāsaṃghikas, the historical Gautama Buddha was one of these transformation bodies (Skt. nirmāṇakāya), while the essential real Buddha is equated with the Dharmakāya. As in Mahāyāna traditions, the Mahāsāṃghikas held the doctrine of the existence of many contemporaneous buddhas throughout the ten directions. In the Mahāsāṃghika Lokānuvartana Sūtra, it is stated, "The Buddha knows all the dharmas of the countless buddhas of the ten directions." It is also stated, "All buddhas have one body, the body of the Dharma." The concept of many bodhisattvas simultaneously working toward buddhahood is also found among the Mahāsāṃghika tradition, and further evidence of this is given in the Samayabhedoparacanacakra, which describes the doctrines of the Mahāsāṃghikas. A statue of Gautama Buddha at Tawang Monastery, India. the Emaciated Buddha, which shows Siddhartha Gautama during his extreme ascetic practice of starvation. The Buddha statue shown calling for rain is a pose common in Laos. In the Pāli Canon, there is frequent mention of a list of thirty-two physical characteristics of the Buddha. The poses and hand-gestures of these statues, known respectively as asanas and mudras, are significant to their overall meaning. The popularity of any particular mudra or asana tends to be region-specific, such as the Vajra (or Chi Ken-in) mudra, which is popular in Japan and Korea but rarely seen in India. Others are more common; for example, the Varada (Wish Granting) mudra is common among standing statues of the Buddha, particularly when coupled with the Abhaya (Fearlessness and Protection) mudra. ^ a b Gethin, Rupert (1998). The foundations of Buddhism (1. publ. paperback ed.). Oxford [England]: Oxford University Press. pp. 224–234. ISBN 0-19-289223-1. ^ Udana Commentary. Translation Peter Masefield, volume I, 1994. Pali Text Society. page 94. ^ Gethin, Rupert (1998). The foundations of Buddhism (1. publ. paperback ed.). Oxford [England]: Oxford University Press. p. 32. ISBN 0-19-289223-1. ^ Damien Keown; Charles S. Prebish (2013). Encyclopedia of Buddhism. Routledge. p. 90. ISBN 978-1-136-98588-1. ^ Rinpoche Karma-raṅ-byuṅ-kun-khyab-phrin-las (1986). The Dharma: That Illuminates All Beings Impartially Like the Light of the Sun and Moon. State University of New York Press. pp. 32–33. ISBN 978-0-88706-156-1. ; Quote: "There are various ways of examining the Complete Path. For example, we can speak of Five Paths constituting its different levels: the Path of Accumulation, the Path of Application, the Path of Seeing, the Path of Meditation and the Path of No More Learning, or Buddhahood." ^ Robert E. Buswell; Robert M. Gimello (1990). Paths to liberation: the Mārga and its transformations in Buddhist thought. University of Hawaii Press. p. 204. ISBN 978-0-8248-1253-9. ^ A. K. Warder, Indian Buddhism. Third edition published by Motilal Banarsidass Publ., 2000, pages 132–133. ^ Kalupahana, David (1992). A History of Buddhist Philosophy: Continuities and Discontinuities. University of Hawaii Press. p. 43. ISBN 978-0-8248-1402-1. ^ , also see Thomas Cleary and J. C. Cleary The Blue Cliff Record, page 553. ^ Dhammika, Shravasti (2005). The Buddha and His Disciples. Buddhist Publication Society. p. 16. ISBN 9789552402807. ^ Sangharakshita (1996). A Guide to the Buddhist Path. Windhorse Publications. p. 45. ISBN 9781899579044. ^ Nhất Hạnh, Thích (1999). The Heart of the Buddha's Teaching. Broadway Books. p. 3. ISBN 0-7679-0369-2. ^ Maguire, Jack (2013). Essential Buddhism. Simon & Schuster. p. 2. ISBN 9781476761961. ^ Seager, Richard Hughes (2006). Encountering the Dharma. University of California Press. p. 81. ISBN 978-0-520-24577-8. ^ Mette Fisker-Nielsen, Anne (2016). "From Japanese Buddhist sect to global citizenship: Soka Gakkai past and future". In Gallagher, Eugene V. (ed.). Visioning New and Minority Religions: Projecting the Future. Taylor & Francis. p. 114. ISBN 9781315317892. ^ Shimazono, Susumu (2003). "29: Soka Gakkai and the Modern Reformation of Buddhism". In Takeuchi, Yoshinori (ed.). Buddhist spirituality: later China, Korea, Japan, and the modern world. Delhi: Motilal Banarsidass. p. 445. ISBN 9788120819443. ^ Major Writings of Nichiren Daishonin, Vol. 1. Soka Gakkai. p. 216. ^ Baruah, Bibhuti. Buddhist Sects and Sectarianism. 2008. p. 48. ^ Sree Padma. Barber, Anthony W. Buddhism in the Krishna River Valley of Andhra. 2008. p. 56.